Household ozonator is a device for the purification of water, air, food and household items; using ozone eliminates bacteria, viruses, odors and a broad range of contaminants. Many people mistakenly believe that the ozonator and ionizer are one and the same device. Although the ozonator produces a small number of ionized particles and ionizer – a certain amount of ozone, they differ mainly produce the different particles. Household ozonizer very extensive scope of application: it helps to remove invisible pollutants in drinking water, vegetables and fruits, children's toys, textiles, kitchen appliances and surfaces to eliminate odor in a closet, the fridge or the whole of the dwelling. Use of an ozonator is not only personal comfort, which arises due to the purified atmosphere in the house: arrangement effectively prevents the spread of viral diseases, improves the quality of drinking water, destroys parasites, pathogenic bacteria, in other words, makes a great contribution to the health of the whole family. In its natural form ozone is found in the atmosphere, especially in the upper layers where it helps to protect the Earth from ultraviolet radiation. But this bluish gas, the flavor of which we can feel after a storm has a very practical application in our everyday life. The artificial production of ozone occurs by passing a powerful electric charge through the air, causing the oxygen molecule O2 dissolves and melds into the triatomic molecule O3. 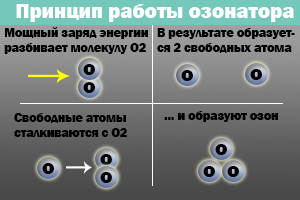 Since oxygen is, by nature, seeks its normal state, ozone is an unstable, reactive form of gas. It is effective for disinfection is already in very small concentrations, destroys almost all known types of micro-organisms and leaves no toxic by-products after chlorination. (1) clean meat, fish and other products, increases their shelf life. Leads to the destruction of hormones in poultry. (2) Cleans fruits and vegetables, reduces the amount of pesticides, agrochemicals and other toxic chemicals that are used for food processing. (3) Cleans rice, removes bran, Aspergillus (leechy mushroom) and carcinogenic substances. 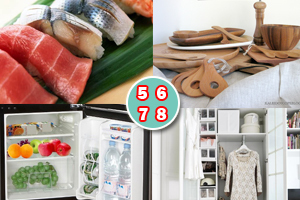 (4) clean the Cutlery and cooking utensils, disinfects and sterilizes, preventing cross contamination. (1) Use of ozonated water for washing hands without soap or other drying means. It is convenient and economical! (2) Washing with ozonized water makes the skin more healthy and attractive, helps to cure acne. Effectively cleans the mouth for cleaning teeth and removes plaque. 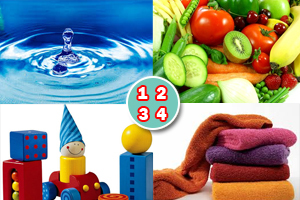 (3) Safely disinfect personal items, including baby clothes without using detergents. (4) Prevents diseases and has a healing effect when helicase (breath), pericoronitis, hemorrhoids, vaginitis. To destroy pathogenic organisms, ozone must come in contact with them for a few seconds. In fact, none of the pathogenic microorganism cannot survive if in a liter of water to pass 1.5 milligrams of ozone for 5 minutes. Think about how much good ozone is able to bring regarding vegetables and fruits. It is ideal for cleaning the products directly, sterilization of kitchen utensils, workspaces, and storage containers. Because ozone has such a short half life, it's not going on the surface, as it happens with chemical cleaning agents. 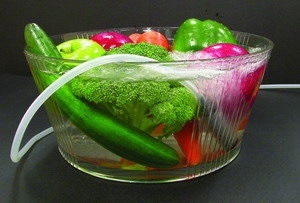 Ozone does not damage the vegetables and fruits in contact. 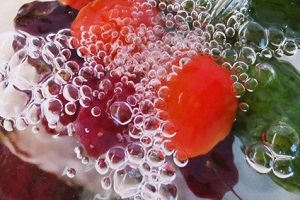 Products such as herbs and lettuce, stay fresh longer and taste better if they are rinsed in ozonated water. Ozone is ideal for cleaning meat, poultry, fish and other seafood, as well as all kitchen utensils for cooking and storage. To purify water with ozone generator, it is sufficient to place the tube into a container of liquid for 5-10 minutes: all bacteria, viruses and weight of the impurities (iron, arsenic, hydrogen sulfide, nitrites and complex organic compounds that give color) will be cleared. For air cleaning device is placed on a high surface and turn on without the hose on for 5-20 minutes depending on the size of the room. Food and household items, placed in a container with water, and then ozonated for 10-15 minutes. The user will note the appearance of foam on the surface of the water, which contains organic and inorganic impurities from the surface of the products. Ozone is a natural purifier that destroys bacteria, viruses, cysts and fungi. Ozone oxidizes hydrogen sulfide, iron, manganese and most chlorinated hydrocarbons, removes soap and oil. As the oxidizer, ozone 500 times more powerful than chlorine and 3,000 times faster at killing bacteria and viruses. Ozone consists of oxygen and leaves no chemical odors and flavors, does not cause irritation and discomfort. Ozone makes the water fresh, clean and crystal clear, speaking an alternative to chemical cleaners. Ozone is not carcinogenic, non-irritating, does not dry the skin, leaves no chemical film, does not destroy and will not discolor hair. The first commercial use of ozone recorded in 1906 in the municipal water supply system. Today it is used in various industries around the world, including in the production of food and bottled water, water parks, aquariums, pools and Spa resorts. On our website you can buy an ozonator for your home: simple, functional and affordable. The lightweight compact model performs an effective cleaning and disinfection of water, air, or any food and items that can be placed in the liquid. Ozonated water is ideal for antimicrobial cleansing and cleaning. We recommend atanacio as one of the most simple and affordable ways to create a perfect cleanliness in the whole house!